Format: Six round Swiss system, 1 hour game plus 2 ends. Players listed in tie-break order. Note: Tie-break changed from points differential to Buchholz points. Format: Barrage. 60 minute time limit, plus 2 ends. Tom Paulo, Lew Gill (Trophy Consolation). Christine Strichen, Gordon Ogden (Trophy Consolation). Graeme Morris, Annick Le Guen (Trophy Consolation). 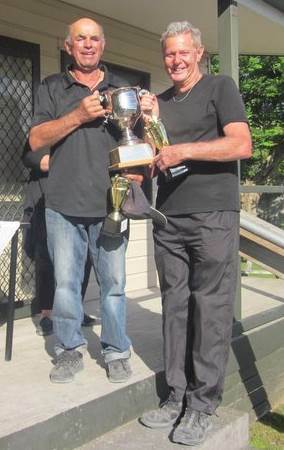 Ray Pierce, Bob Bridge (Trophy Consolation). Sharon Cannon, Pete Hamilton, Shirley MacDonald, Claire Wilson 5 equal. Bob Bridge, Lewis Gill, Annick Le Guen, Christine Strichen 5 equal. Claire Bradburn, Colin Bunce, Yvonne Futcher, Dave Gatchell 5 equal. Ann Hogg, Margaret Maher, Margaret Mordecai, Sarah-Jane Wright 5 equal. Format: Four round Swiss system, 1 hour game plus 2 ends. Ian Baker/Bob Bridge (Herne Bay), Françoise Case/Alain Coulomb (Herne Bay), Christian Fouquet/Pam Jenkins (Herne Bay), Andre Noel/Tom Paulo (Vikings) 5 equal. 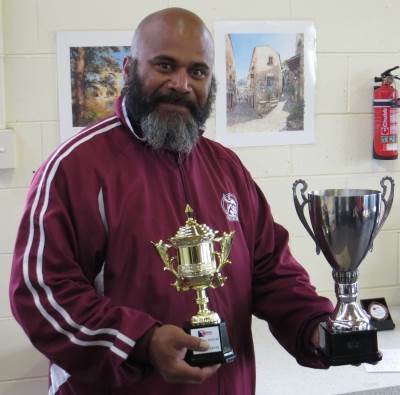 Clive Bartleet (Vikings)/Tumua Faitele (Panmure Pioneers), Jean-Pascal Cuer/Thierry Pannetier (Herne Bay), Annick LeGuen (Kapiti)/Ruby Vakauta (Vikings), Brett Maguire/Kevin McFadgen (Kapiti) 5 equal. Ann Clayworth/Claire Matthews (Northcote), Cathryn Lyall/Phillip Lyall (Dunedin), Angela Maxted (Kennedy Park)/Jean Parley (Stanley Bay), Niau Ruta/Tiki Ruta (Vikings) 5 equal. Barrie Clayworth/Bruce Cooper (Northcote), Kevin Davis/Lidya Davis (Vikings), Kay George/Mervyn Wilson (St Kilda), Eileen Lippard (Kennedy Park)/Ros Morton (Herne Bay) 5 equal. Brian Frampton (Kapiti)/Shirley MacDonald (Otaki), Kathy Gatford/Tony Gatford (Kapiti), Kay George/Mervyn Wilson (St Kilda), Pete Hamilton (Wanganui East)/Ann Hogg (Otaki) 5 equal. Colin Bunce/Marilyn Bunce (Alexandra), Les Clearwater/Keith Dixon (Christchurch), Lew Gill (Horowhenua)/Shirley Selwyn (Wanganui East), Ros Morton (Herne Bay)/Ann Shields (Epsom) 5 equal. Format: Round-robin, 1 hour game plus 2 ends. Margaret Maher/Jean Parley/Margaret Penny 7, Claire Bradburn/Ann Hogg/Monica Smiler 13. Sharon Cannon/Christine Strichen/Claire Wilson 13, Claire Bradburn/Ann Hogg/Monica Smiler 8. Karen Stephen/Tina Targett/Chris Taylor 6, Maryon Beer/Sandra Hay/Alice McGuigan 13. Kathy Gatford/Jo Maxwell/Judith Williamson 4, Maryon Beer/Sandra Hay/Alice McGuigan 13. Format: Five round Swiss system, 1 hour game plus 2 ends. Teams listed in tie-break order (Buchholz points). The top 8 teams qualified for the Trophy, the next 8 for the Plate and the bottom 6 for the Bowl. Maurice Beltz/Miles Cowper/Michael Rocks, Sharon Cannon/Christine Strichen/Claire Wilson 3 equal. Karen Stephen/Tina Targett/Chris Taylor, Cathryn Lyall/Phillip Lyall/Kathleen Wallace 3 equal. Grant Bray/Morgan Choveaux/Nico Toyne, Marilyn Bunce/Shirley MacDonald/Sheryl Parslow 3 equal. Steve Frampton/Brett Maguire/Tony Simpson, Kathy Gatford/Barbara Nicholls/Alan Taylor. Derek Cooper/Elva Cooper/Paul Husband 6.